Whether around the Mediterranean basin or the Middle East, ancient civilizations clash to control the most beautiful territories. The game is an exemplary fluidity thanks to the system of choice of action by the wheel, system included in Imperial. ANTIKE (German name for antiquity) is a strategy game with the theme of evolution and struggles of ancient civilizations. Ancient civilizations create cities, build temples, sail on the seas and make scientific progress. Their legions and galleys establish new colonies and defend their population against their enemies. Two scenarios are available depending on the face of the game board used, players can choose from Greeks, Romans, Germanic tribes, Phoenicians, Carthaginians, Persians, Arabs, Egyptians and Babylonians. will try to recruit kings, scientists, generals, citizens and famous navigators. The nation that first succeeds in recruiting a determined number of these historical characters wins the game. You must lead one of these nations to victory! Beware of enemies who will try to conquer your cities and destroy your temples. 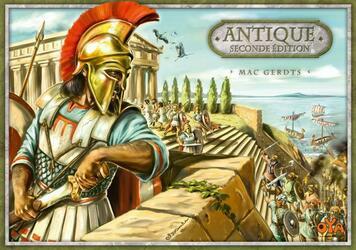 This new edition of the 2005 Ancient Game differs in several ways, starting from the pawns cited for each player, more expensive military units, an easier city conquest, neutral temples, modified scientific progress. You will also find two new cards with a new graphic.